A jigsaw puzzle is a puzzle that requires the assembly of tiles or interlocking pieces in such a manner as to form a picture or a three-dimensional structure. The jigsaw pieces may be made of cardboard, wood, plastic, rubber, metal or foam. Jigsaw puzzles can range in difficulty from very easy three-piece puzzles for toddlers to the current record holder, Life - The Great Challenge puzzle, with a whopping 24,000 pieces! The first jigsaw puzzle was believed to be constructed around 1760 by British mapmaker John Spilbury. Spilbury took one of his world maps, pasted it to a sheet of hardwood and cut around the borders of the countries with a fine-bladed saw. The result was a useful visual aid to help children learn world geography. Cardboard didn't become the material of choice for jigsaw puzzles until the 20th century when puzzle companies began using dies. The popularity of the jigsaw puzzle reached its peak during the Great Depression, as piecing them together was an inexpensive way to pass the time during long periods of unemployment. Jigsaw puzzles come in all shapes and sizes. Very young children are likely to start off with peg puzzles, usually made of wood with large pieces to which a peg is attached for easier manipulation. Sound puzzles are puzzles in which realistic sounds are played when the pieces are properly placed on the board, helping youngsters learn about the relationship between cause and effect, develop early vocabulary, and motor skills. 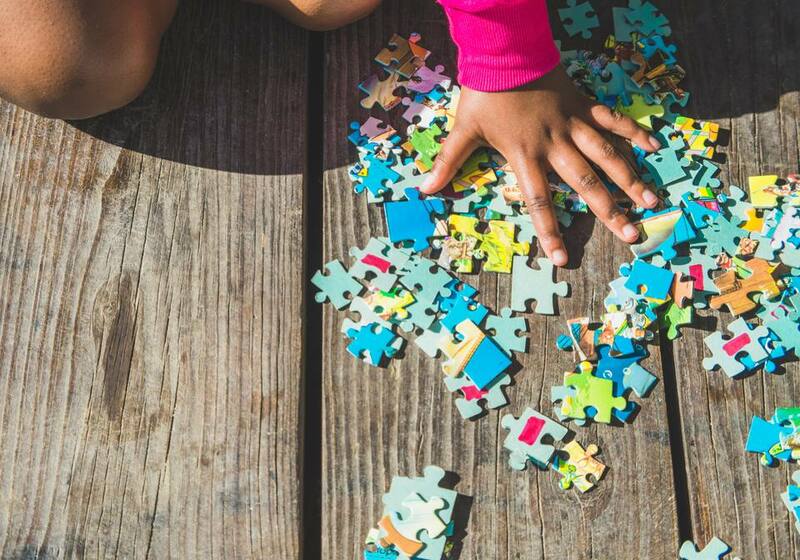 Floor puzzles of 50 pieces or less, with large pieces generally made of cardboard, are meant for children aged 4 and up with better dexterity—and who are not as likely to eat the puzzle pieces! Adults generally prefer jigsaw puzzles with 500+ pieces. These puzzles come in a wide variety of themes: animals, scenic views, fantasy, art and much more. There are some interesting variations, such as Buffalo Games' World's Most Difficult Jigsaw series, where the image is printed on both sides of the puzzle, photomosaic jigsaw puzzles, consisting of thousands of tiny images blended together to create a larger picture, and mystery jigsaw puzzles in which you must piece together the clues in a booklet as well as the puzzle, which may be totally different from the image shown, in order to solve a murder mystery. As the name would imply, 3-D puzzles have three dimensions. They might be representations of buildings, as in the Puzz-3-D series by Wrebbit®, now owned by Hasbro. 3-D puzzles may also be spherical in shape, as in the new Puzzleball series by Ravensburger. 3-D puzzles representing dinosaurs and other animals, food items, motor vehicles, and toys are available as well. Certain two-dimensional jigsaw puzzles use lenticular imagery to give the puzzle the illusion of depth or movement. Though they are not true three-dimensional puzzles, some vendors refer to these as 3-D puzzles. There are many free jigsaw puzzles that you can download and play offline on your computer if you so choose. Many other sites also offer free jigsaw puzzles online that can be played directly within your browser. Most jigsaw puzzles found on the Internet are fairly easy to do, generally with fewer than 50 pieces. However, you can purchase packages containing dozens or even hundreds of jigsaw puzzles which can be considerably more complex, with piece counts going into the hundreds. Visit our online Jigsaw Puzzle Store for wooden puzzles, peg and sound puzzles for toddlers, easy jigsaw puzzles, floor puzzles, alphabet and counting puzzles for older children, intermediate puzzles (300-500 pieces) for children of middle school age, 1000+ piece puzzles with subjects ranging from art to zebras, 3D puzzles and Puzzleballs, and, for hard-core jigsaw fanatics, extra-challenging puzzles with as many as 24,000 pieces.